← Manila’s Public Transportation – a pictorial essay. It was 1952, I had just “graduated” from kindergarten at St. Paul’s College on Herran which was just a few blocks away from where my family had an apartment at the corner of Mabini and Tennessee Ave. I managed to survive that year, successfully eluding the nuns with their rulers that seemed to mysteriously be hidden in the folds of their habits. They came out rather quickly and before one could cry “mommeeee” , they gave you a sharp rap on the knuckles. So, here I am in the front row with the tie waving at the camera. The smiling nuns apparently happy to finally see me go. I’m kidding, of course. My kindergarten graduation at St. Paul’s – 1950. My mom, bless her heart, decided I should go to the American School. I think her plan all along was that if I learned via the American curriculum, I would be better prepared to study in the U.S. at some point. So I started first grade at the American School on Donada street, my teacher was the very grim and no-nonsense Mrs. Goodier. Her sense of humor perhaps paralleled that of the infamous Joseph Goebbels. My first grade class-1952. I’m in the back row, 2nd from left. Of course being ADHD and surrounded by a new environment and new friends, I was constantly talkative and disruptive (or so said Mrs. Goodier). Heck, I was just a friendly little fella. It mattered not because I went on to the second grade where I was promptly rated as a smart kid and immediately skipped to third grade. Ha, take that Mrs. Goodier ! 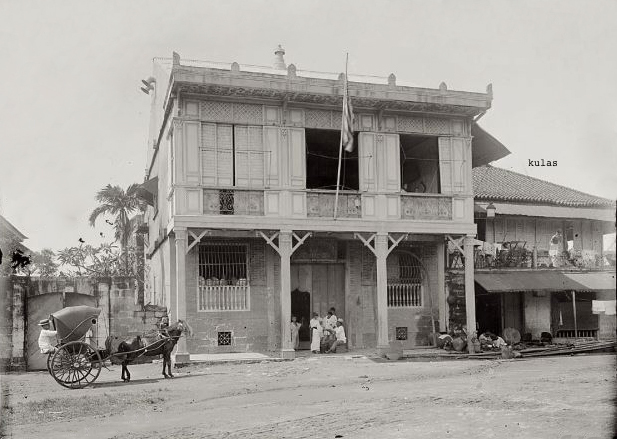 After the first wave of soldiers and their wives settled in Manila after the Spanish-American war, more businessmen arrived with their families. All of these newly migrated Americans obviously needed to educate their children but the choice of American education was quite slim. Home schooling worked for some and even some enterprising mothers set up private “American schools”. In 1901, most American families still lived within close proximity of Intramuros. An American school featuring American teachers and curriculum operated within the old walled city on Calle Victoria. There were several privately-funded “American” schools in this early period, mostly paid for by the American families with subsidies from American businessmen. This rankled many because they were already taxed for public education and yet had to pay for private American schooling if they wanted to ensure an easy transition for their children when it would be time to further their education at stateside colleges and universities. 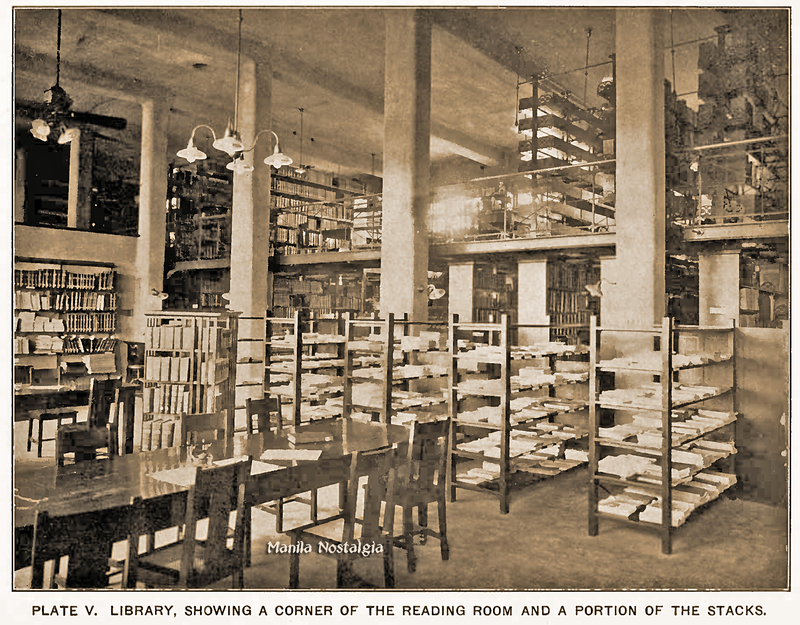 The smaller, private schools were expensive to operate and maintain and perhaps out of desperation, a Board of Trustees was created and the American School was incorporated in 1920. The biggest problem was finding a location for the growing demand of students increasing each year. On June 21, 1920, the American School Inc. opened its doors. A small two-story building at 606 Taft Avenue opposite the Philippine General Hospital was found to be suitable. It was called the House of the Holy Child and belonged to the Episcopalian Church. Rev.Bishop Mosher made the building available, rent-free for the first two academic years but private donors had to pledge P10,000 to get the school underway. 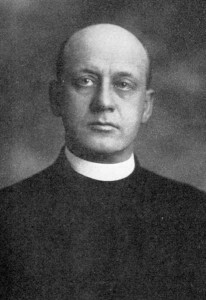 At the end of this period, Bishop Mosher requested the return of the building for its church missions. As a viable and sustainable enterprise, the school was on shaky ground. As the start of the new school year in 1922 drew closer, the school board frantically searched for a new building. 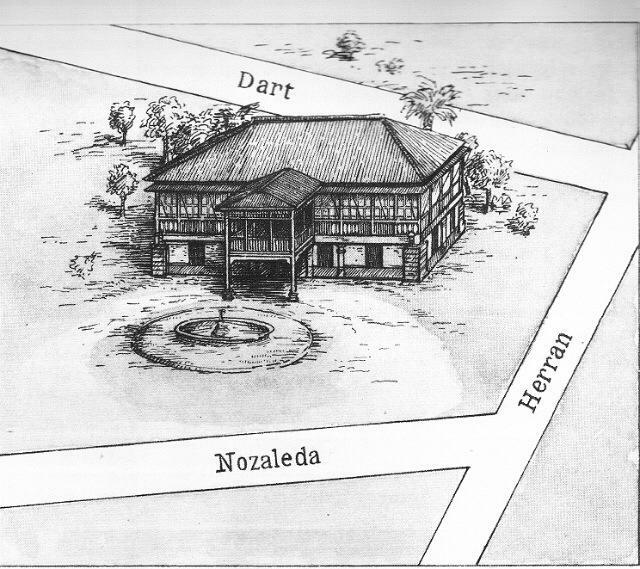 As luck would have it, a new location was found at 115 Padre Faura (where the old Acme Market used to be) and Mrs. Elizabeth Marshall was installed as principal. The school had found its home for the next 6 years. Also fortunate was the admittance of over a 100 new students to add to the school’s revenue. 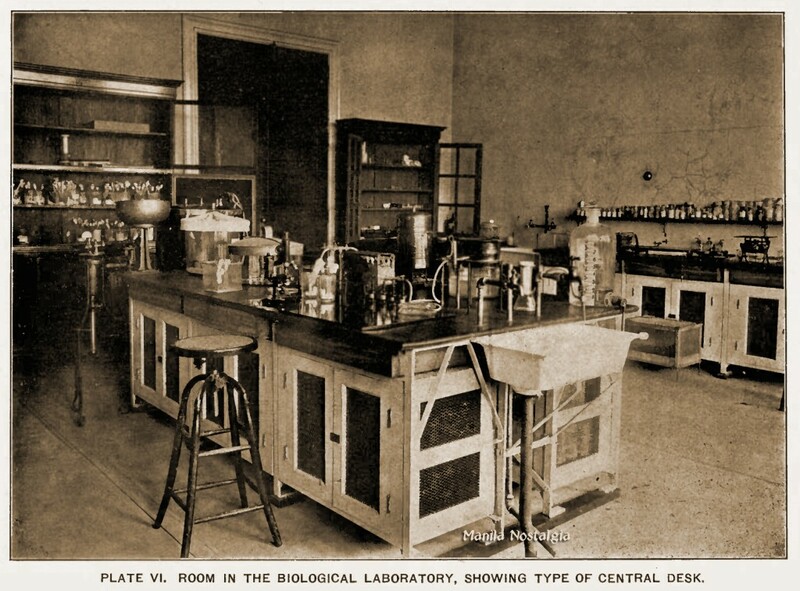 Although facilities at the Padre Faura school were minimal, the high school students were allowed to use the library and labs at the Bureau of Science for research. 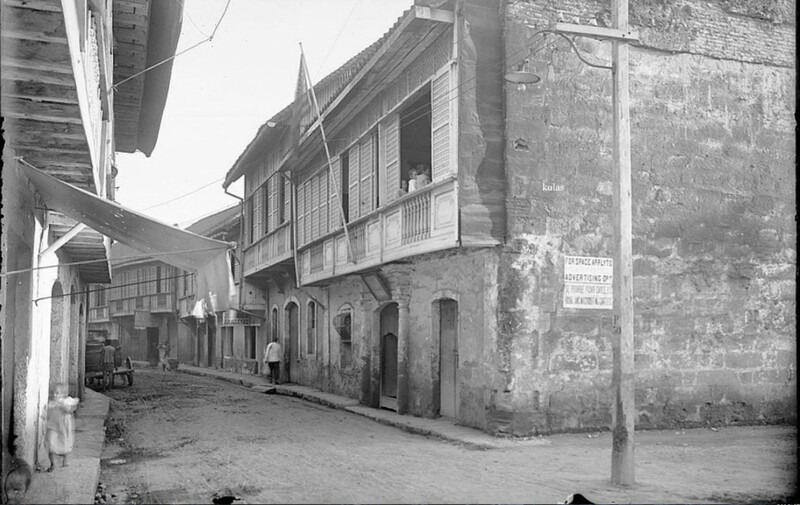 By 1928, the building on Padre Faura became so crowded that roomier quarters at the corner of Aldecoa and Mabini (behind the Admiral Apartments) were rented. The new edifice, a rambling wooden structure, proved much more satisfactory than the old location. (It’s interesting to note that this building was also used by one of the private “American schools” in 1919.) The school remained here for the following eight years. It was just a few steps away from the breakwater of Manila Bay; the children found it a pleasant playground at recess. 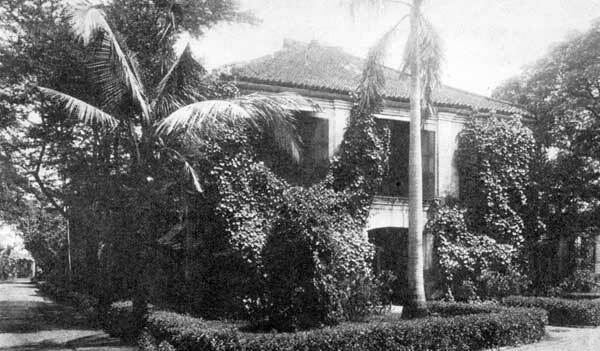 Mrs. Beatrice Grove, whose husband helped raise the American flag over Fort Abad Santos, became principal in 1925 and under her guidance, the school thrived until its move to the permanent Donada street location. Fortunately that mindset started to change after the war. Albeit slowly, the school’s policy evolved to admit mestizos, Filipinos and even an Indian/Filipino/Spanish kid like me. 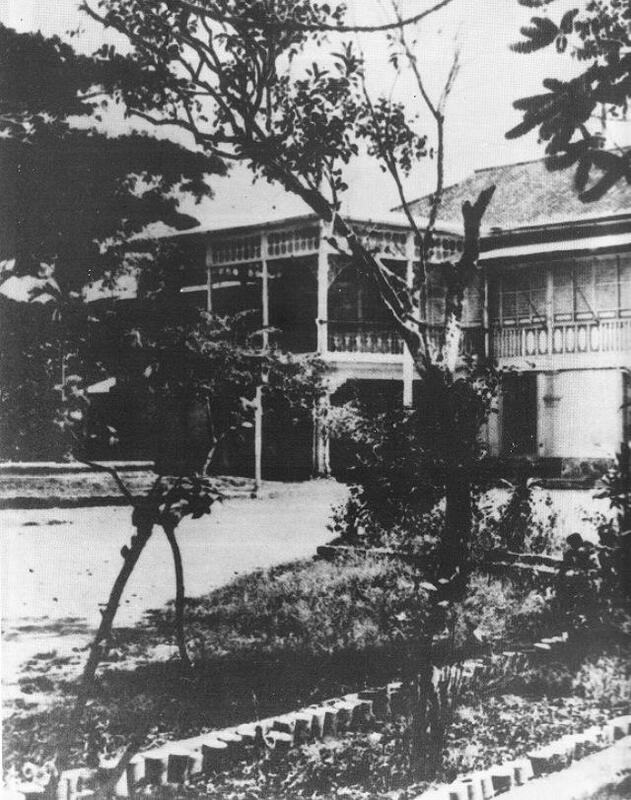 The American School was later renamed to International School of Manila and today reflects a completely diversified student population. 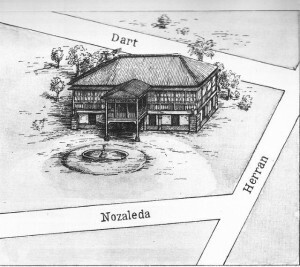 During that early period, another new public school called Central School opened in 1914 on Taft Avenue corner Padre Faura. 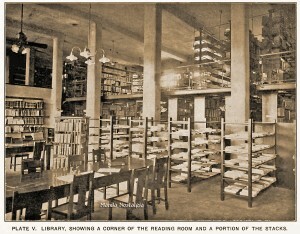 As with all public schools, it was also administered by the Bureau of Education but still reserved for American students. However by 1920, out of a total enrollment of 600, slightly more than half of the students were mestizo – typically American fathers and Filipino mothers. Some parents felt that the original intention of an all-American school had been diluted. Although many considered Central to be less snobbish and less anti-Filipino than the American School, in fact, it was de facto segregated; it admitted only a few talented and high-status Filipinos until 1932 when Gov. Gen. Theodore Roosevelt Jr. decreed that competence in English rather than race or citizenship would determine eligibility to attend. The school was later named after H.A. 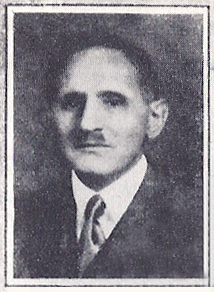 Bordner, Manila school superintendent. A fierce rivalry grew between the American School, Central and even Brent School in Baguio, especially during basketball competitions. Clif Forster (A.S. alum 1941) mentioned the “big” game at Baguio the weekend before Manila was bombed on Dec.8th. After an exhilarating win against Brent, the A.S. kids were bussed back to Manila. Had they stayed, they might have been caught in the bombing of Baguio by the Japanese. The photo below shows the Scheerer compound in the background. The swamp would later be filled in and become the American School campus. Plans were drawn up to buy a permanent home for the school, and with the help of patrons and donations from the community, this goal was achieved. Construction of a two level concrete building that was earthquake, storm and fire proof started in the early months of 1936. 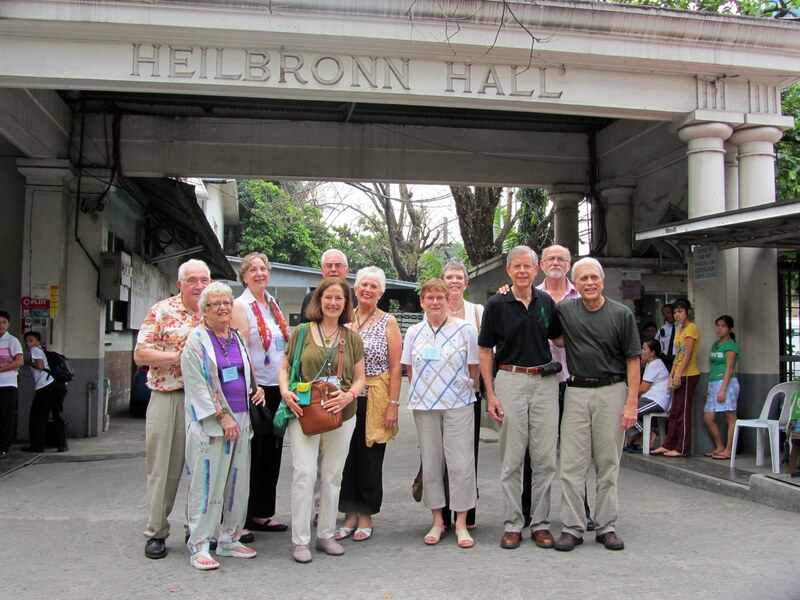 Quite active in the American community, businessman J.P. Heilbronn made a substantial donation of ₱5,000 for a fence to surround the property. After the Christmas holidays, the students were welcomed to their new school building. One of the first classes to graduate from the Donada school was the class of 1937. John Daye was a member of that class and sent me this photo of him and his fellow graduates. They are wearing the dress styles of the day, tropical white suits and dresses. The primary, elementary and high school students that crammed into one building soon proved to be a significant burden when once again, the Heilbronns made another generous donation of ₱50,000 for the construction of another building. Christened Heilbronn Hall, the new building was finally completed in the latter part of 1939. It included a gymnasium with a balcony, a stage, classrooms, and shower rooms for girls and boys. 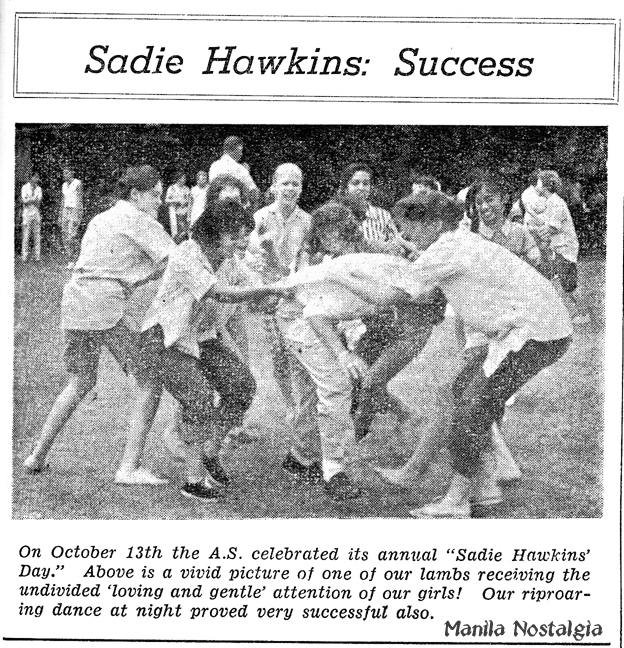 It was also that year that the American School joined MAASS (Manila Athletic Association for Secondary Schools), competing with other Manila public schools in volleyball, basketball, tennis, softball, bowling, badminton, swimming and polo. 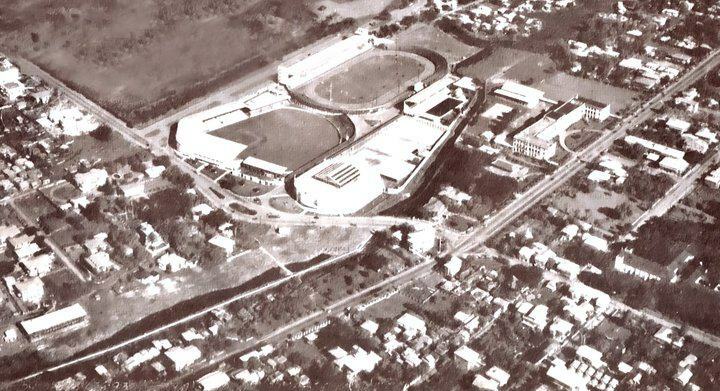 Not having a proper swimming pool and track and field, sports activities were held at the Rizal Memorial Field. The trim, well-kept grounds surrounding the school made the wall-enclosed compound an odd little oasis with a strikingly American atmosphere. As the school year for 1941-1942 opened, all the signs of a typical American school were visible on Donada Street. Army buses and cars dropped students off at the school, creating a good-size traffic jam. Some of the older lads volunteered for the School Traffic Patrol shown in this photo in 1952. Each elementary teacher taught all subjects in their class. Phys Ed. Music, Art and Spanish, notably Señorita Martinez, were handled by special teachers. The classes took on a wide variety of projects and productions over the course of the year, to which the entire school was invited (and expected to come). 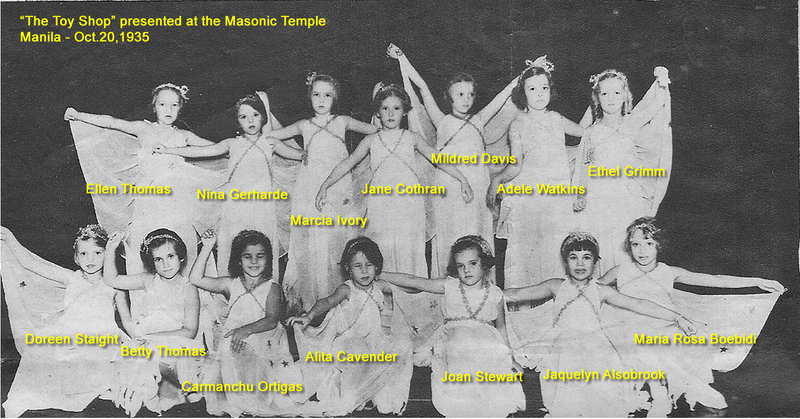 Some of them were presented at the Elks and Army and Navy Clubs or at the Masonic Temple where Doreen Staight played a fairy princess in 1935. Scouts were the largest activity group in the school, with Brownies and Cubs in the elementary grades, and Scouts for older boys and girls. Nearly every elementary boy belonged, and many after school activities were connected with these troops. 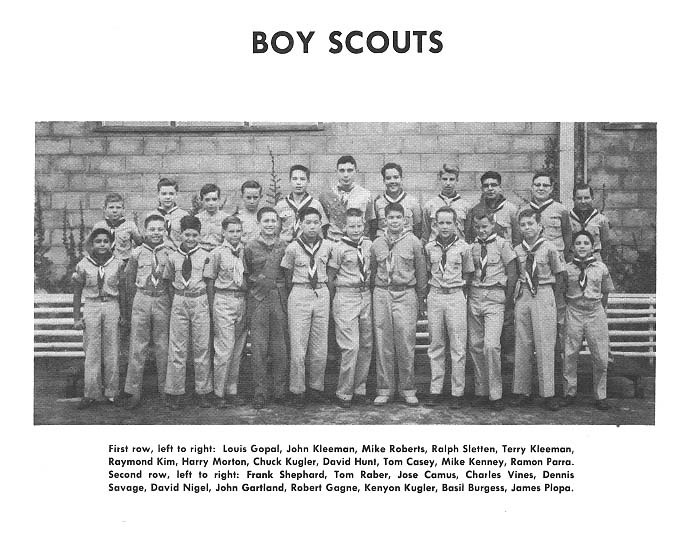 Here I am in the Boy Scouts in 1957 (1st row, far left). In early spring 1941, as the threat of Japanese invasion suddenly grew more serious, the student population dwindled as the military and state officials started returning their dependents back to the States but on the other hand reassuring worried civilians that “the Japanese would never dare attack the Philippines”. Well, the inevitable happened and Japan did indeed invade the Philippines; air raid shelters were built at several hotels like the Manila Hotel, sandbags protected the entrance of the Bayview Hotel as bombers flew over Manila destroying Nichols Field, Santo Domingo Church, the ports and on to Baguio as well. Monday December 8th, news of the attack at Pearl Harbor and Japanese air raids forced the school to close and wouldn’t reopen for almost 5 years. Kids were picked up by their drivers, fathers came home from work and mothers fretted about what was coming next. Within a few weeks, the Americans were required to register as “enemy aliens” and sent to the internment camp at University of Santo Tomas. The Japanese military took over the American School compound. It was used as a camp and prison where criminals were punished and tortured within the walls of the campus. Neighboring residents claimed that several men were hanged; others told tales of hearing men’s wails as they were being tortured. The war closed both Central and American Schools. 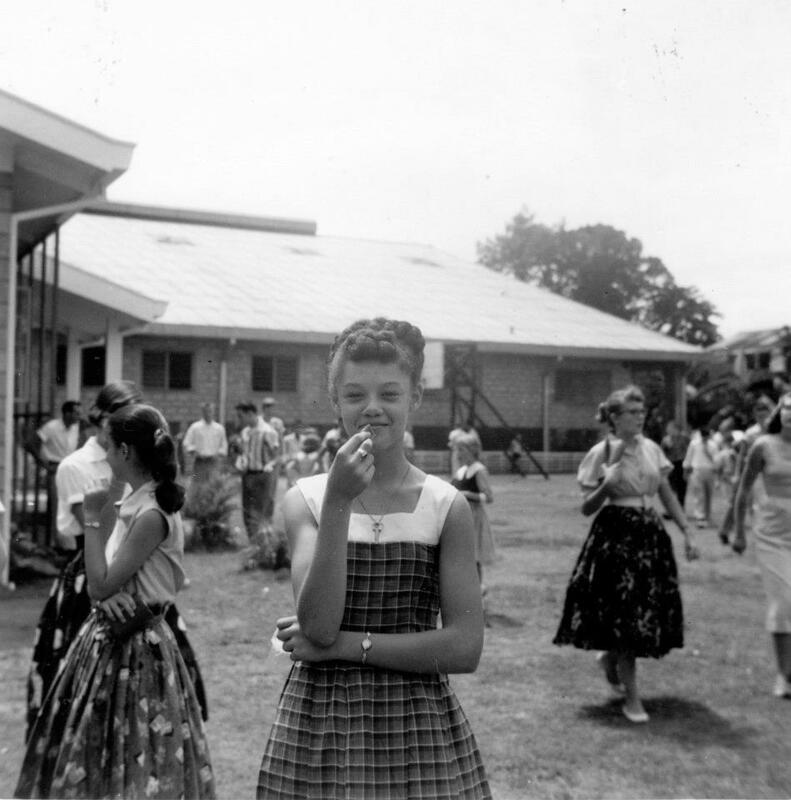 As American families were herded into the internment camp at Santo Tomas that first week of January, the childrens’ education was carried on with surprising vigor under Louise Croft, who had arrived in 1941 to replace Glen Miller, Principal for the years 1938 to 1941 at the American School. It would be a little over three years of internment. The families struggled to maintain a “normal” life but the years of a starvation diet took its toll. Although first on the priority for being fed, the lack of healthy meals made the children weak and listless. It was more than difficult to keep their interests in school keen. Below, the diploma Margaret received. Each diploma was a hand-drawn original. The Battle of Manila was bloody and devastating. My own parents were caught in the Malate area conflagration. Pregnant by 8 months, my mother ran the streets with my dad, making their way north of the Pasig, trying to avoid the house-to-house fighting between the Japanese and American forces. How they made it through still amazes me but I was born in the Sampaloc area in April, 1945. Manila streets and neighborhood stand in rubble. 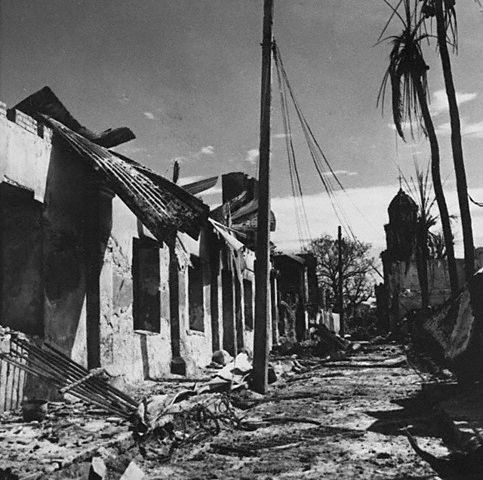 Throughout the fire, shelling, and counter-shelling, the American School buildings stood as a symbol of American culture, and, when the dust of battle had cleared away, they remained unscathed in the midst of a battered and torn Manila. After the area had been cleared of enemy troops, a food center was set up in Heilbronn Hall while the Main Building served as a hospital for the sick and wounded. 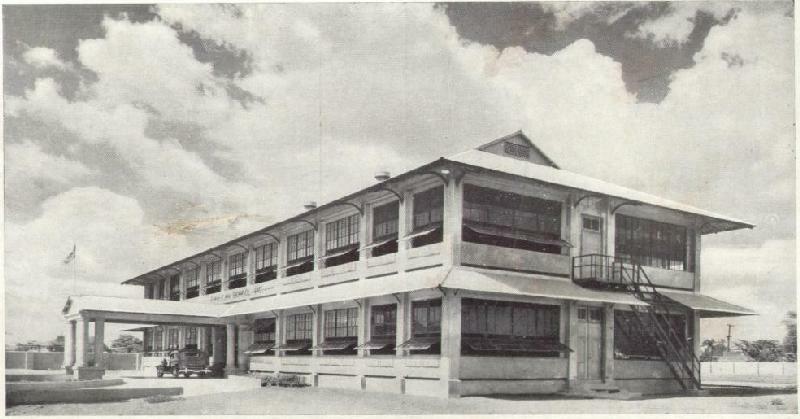 When the need for a hospital had disappeared, the Main Building was converted into a warehouse and finally, the Philippine Relief and Rehabilitation Association (PRRA) took charge of both structures. In February 1946, the remaining school board trustees came together to determine the future of the American School. There were significant problems to overcome: getting the old property back from the current occupants, PRRA; raising sufficient funds to restore any building and grounds damage, refurnish and re-equip the school, and obtain a principal and teaching staff. Somehow the funds were solicited, the plan came together and Mrs. Lois Croft was re-hired as she had been repatriated back to the U.S. after her liberation from Santo Tomas. Tentative enrollment was 564 students. On September 9, 1946, the American School once again threw open its doors and stood ready to offer its first post-war student body the best in education. Although at first, grades one through twelve were situated in one building, Heilbronn Hall was soon renovated and roomier classrooms were given to the lower grades. 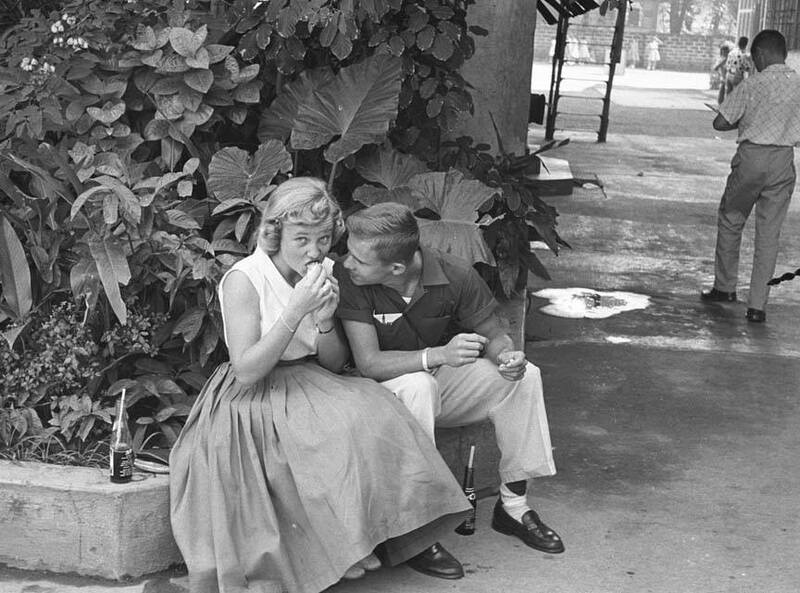 In the early 1950s, more overcrowding caused by returning expats, diplomats and businessmen, as well as alumni that had by now married and were sending their children to the A.S. , forced a few lower grades to be temporarily housed at the SeaFront compound off Dewey Blvd. 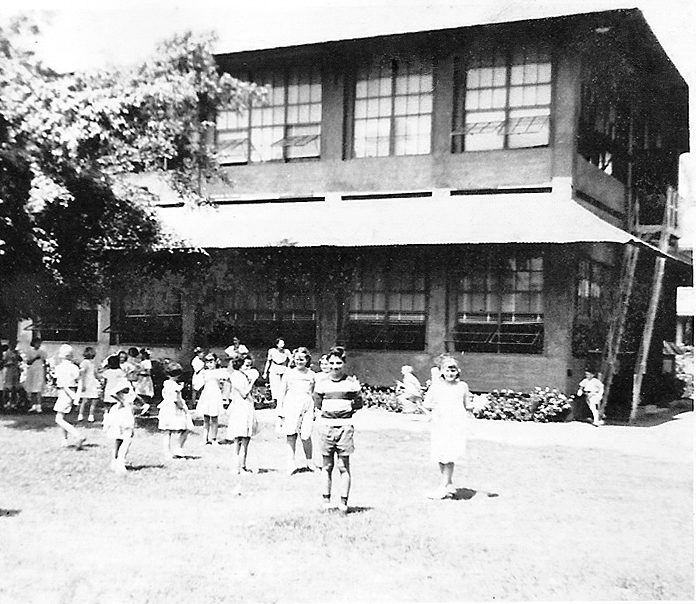 The school expanded even further with the addition of South Hall in 1953 to accommodate elementary classes. In 1955, the Raymond Spruance Hall (actually a gymnasium and stage for assemblies and such) was completed along with the “new” canteen. Below our class prepares for assembly inside the new gym. I’m the short guy, second from the right of Mrs. Grant. We were all agog when Pat Boone came to one of our assemblies complete with white buck shoes and the all American look. Even the Everly Brothers gave our school an autographed photo when they played at the Araneta Coliseum in 1961. By 1958, I started 8th grade. The boys then adopted the latest American dress style with low-waist pants; shirt tails had to be tucked in but we sported rolled up short sleeves and of course your collar had to be pulled up, ala James Dean. The girls all wore dresses with crinoline petticoats and flats. Typically dressed in this photo are from left: Barbara Fales (in the background), Gammy Garritz, Edgar Priestman, John Hendryx, Lee del Pan, Allen Staley, and Paul Hoshall. School started at 7:30am , we had recess at 10:30 and let out at 12:30pm. I felt sorry for the military dependents who lived on Sangley Point (Cavite). They had their own elementary school but the high school kids had to get up at the crack of dawn and catch the launch that would drop them off behind the Army Navy Club then take a bus to the school. They were a tough bunch. Jeans were not allowed during school period except for once a year, there was this peculiar thing called “Sadie Hawkins Day”. It was a race and a dance named after the gal in the Lil’ Abner comics. The boys were allowed t-shirts, jeans or shorts, the girls wore jeans as well and the style was to wear their dad’s white shirts that often hung loosely on them. We were all so excited and wound up anticipating the big “race” around recess time. The boys lined up on one side of the field – all properly greased with Purico, the local version of Crisco. The girls lined up on the other end of the field. Then a signal was given and the race was on. Whoever was tagged by a girl was then obliged to go to the Sadie Hawkins dance with her. I always wondered why we boys ran so hard to avoid the girls ? Even after the two new buildings were added, the Donada street campus filled up, allowing no further expansion. In 1956, the Board discovered the school might be eligible for grants under the U.S. State Department. Applications were made to set up a Filipino scholarship program and purchase new property for a campus in Bel-Air, Makati. 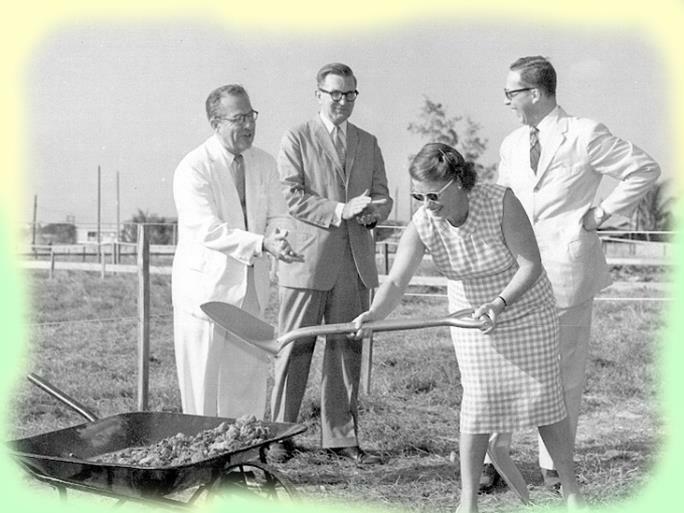 Construction began immediately and on June 20, 1961, the elementary school opened with an enrollment of 647, kindergarten to Grade 6. This photo-op is the ground breaking ceremony taken at the Salamanka Gate in Bel-Air. From left is John Hickerson, Newland Baldwin, Mrs. Carolyn Butler and Lud Amudj. I graduated in 1962, the last class to graduate from the Donada school. We had a senior skip day given as a perk for us exalted seniors. I think we went to Matabunkay that year. 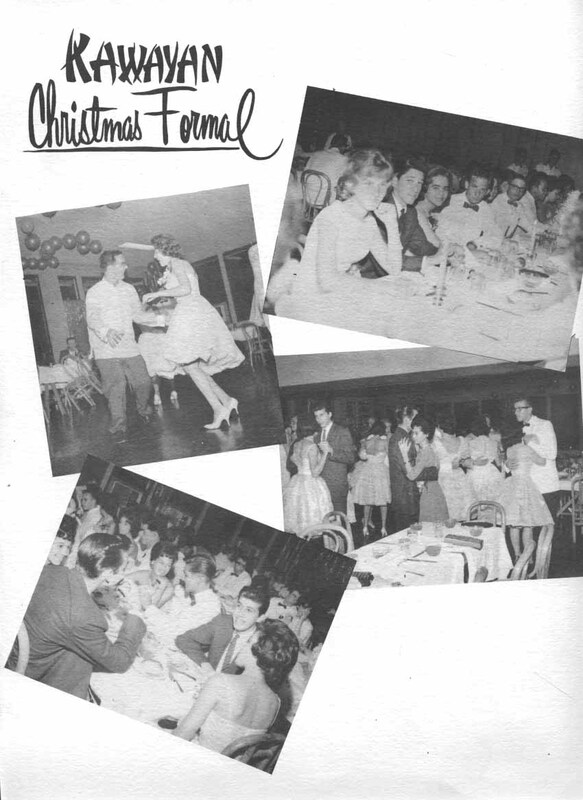 The highlights of the year were our Christmas formals and of course, the annual Junior-Senior Prom. And just like that, my carefree days were over. My mom and I settled in Seattle. 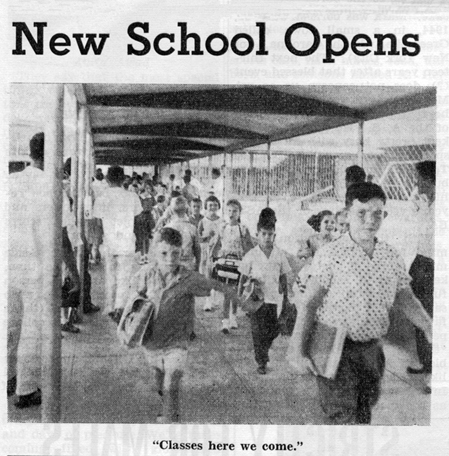 It was the start of the 1963 school year. I went on to college, got married, had a son by the time I was 19. My generation was caught between waves of conservatism and liberalism. The war in Vietnam raged on. Students marched, sang and protested against the war and the government’s enforcement of the draft. It was a very confusing time but I’ll always remember those glorious and wonderful years of growing up in Manila and my time at the American School. Even to this day, we still hold alumni reunions which are well-attended. Old friends come together. We smile, we hug, maybe a tear or two are shed, and we talk as if the years had not gone by. I miss those days, I truly do. The photo below was taken in February 2012. We were allowed to tour the old Donada school which is now Arellano University School of Law. It was in great shape and looked pretty close to what we remembered although we never had air conditioned classrooms ! Well, you just can’t go back, can you ? 42 Responses to My Alma Mater – The American School, Inc. This is a great article. I still consider Manila my home having spent 10 years there, 5 at AS and five at IS (1966-1976). As the landmarks from our past disappear, it is fortuitous someone had the good sense to take photographs and keep written records. Thanks for taking me down memory land. and I amazed myself at how many of my classmates names I remembered. I guess those wonderful memories are still filed in my “rolodex”. Thanks and please keep you the wonderful work. Another winning article. I went to AS for 1st, 2nd and 3rd grades. Then back for 9-12. 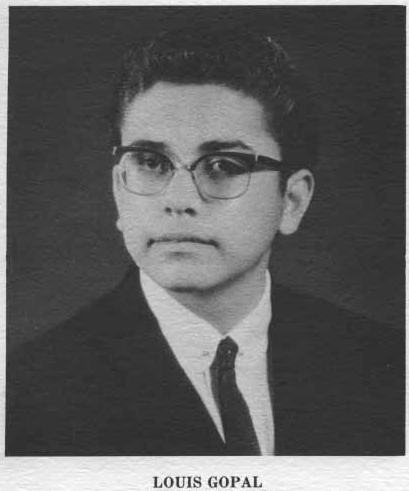 I should have graduated with class of ’61 as that is who I started with. Went to St. Scholastica inbetween, and year in Australia caused me to loose a year. If you look at last Christmas formal photo, you will see Boots Taylor (deseased) with her date George Gallent(Manila), and Pilar Urra (Kurtis) lives in Madrid and her date Honey Muniosguren(Manila). Both in photo seated and then dancing. Not sure why I was not in picture as I did hang out with them. I probably did not have a date. I also see Walter Murawsky dancing with Anita Awad and Bobbie Fales, but did not recognize partner. I think the person dancing with Bobbie Fales is possibly John Stuller. as usual, another piece well done! Stop these as I am running out of tears .. but they ARE tears of sweet memories! Sigh! Congrats, primo! Thanks for a great trip back. Really do miss those days at the old “AS”. Can’t believe it has been over 52 years since I last set foot on the Donada campus. Wow..the definitive concise history of our school and great photos. Proud of my alma mater…what a rich and unique bond we share! A girlfriend of mine tagged me to this article knowing that it was my alma mater. In her post she stated that it was where I tasted FREEDOM. And I replied that it was “freedom but not as in free to do what I wanted to do but as in FREE TO BE ME! free to think…free to discover…free to learn…my education at International School changed everything in my life…momentous and I am so very grateful!” Loved reading your article and seeing all the photos. Thank you. My mother wanted me to learn English. So in 1964, we went to the old Donada campus. It looked old and unkempt. We were redirected to the new Belair campus. I was so happy because the classrooms were airconditioned. So from 1st grade to 9th grade, I really felt that I received the best education ever. AS/IS prepared and molded me in the coming years here in Los Angeles, California. Thank very much Lou for an excellent and nostalgic article. Mabuhay! Nice job, Lou! I’m so grateful you take the time and the energy to put together these wonderful memory pieces. Although I think I have a good memory, you still seem to find the bits that I managed to forget, and it’s so special to be reminded of those wonderful days of our youth in a very special place, the Philippines! great article mr. gopal. i never knew that about my law school..no wonder there was always this eerie feeling in the first floors.. thank you and congrats on your website. Be careful, there are still ghosts of past teachers under those floor boards ! Fascinating! — a brilliant piece of history that has touched my life as well from 1964 – 1970! Thank you, Lou, for your painstaking research — the photos of the very early years are priceless. Another great article! I absolutely love your site and am constantly amazed by the number and quality of the photographs and the wonderful articles! Thank you so much again for this! I went to AS when it was already International School (1975-83) and I knew nothing about its history before Bel-Air. Thank you for sharing! Also born and raised in Manila and having gone to school at another American founded institution at nearby Taft Ave. just a few years after American School transferred to Makati, I was often lost in thought as a kid wondering what it was like leaving the country of your youth and settling down oceans away. It never occurred to me that even former expat classmates of various nationalities whom we thought didn’t give a hoot about our country, even those who stayed for just a few years would now have the similar nostalgic urge to get back to their formative roots and reestablish old contacts in Manila the way we do. I feel so rejuvenated, it’s almost like bathing in the fountain of careless youth. We’re not getting any younger, but Lou’s Manila Nostalgia amazingly helps put the pieces back together where our memories would fail recounting such priceless details. Lou, I take it that the Otto Scheerer in one of the pictures you featured is the same OS, one of the pioneer settlers of what would become Baguio City. He’s also featured in a photo (ca 1900) with members of the Worcester-Wright Commission “around the Baguio plateau in late July to early August 1900 [that] validated earlier recommendations made by the Spanish Benguet Commission It was the ideal site for a hill station and health resort” (“City of Pines: The Origins of Baguio as a Colonial Hill Station and Regional Capital” by Robert R. Reed with photographic research by Erlyn Ruth E. Alcantara. A-Seven Publishing, Baguio City, 1999. Originally published by the Regents of the University of California, 1975). Otto is shown with his son Adolfo. Otto, I believe, settled in Baguio in the mid-1890s; previous to that he was a resident of Manila. Wow, Lou–you’ve done it again. Your history of the American School is a wonderful gift. Thank you. more slower, kindler and decent. Unlike today when life seems to be encapsulated in a few sentences and posted on Facebook for all to see! Thank you, Lou, and keep them coming. Wow. What a great piece of history you’ve shared! I am a military brat. A member of the JUSMAG group AKA “The Sangley Gang” that were allowed to attend AS/IS beginning in 1971. I may hold the distinction of being the worst student to hold an AS/IS diploma. Prove me wrong, I dare you! I have many fond memories of my time there and of some very fine classmates in the Class of ’72. I’m a little confused. 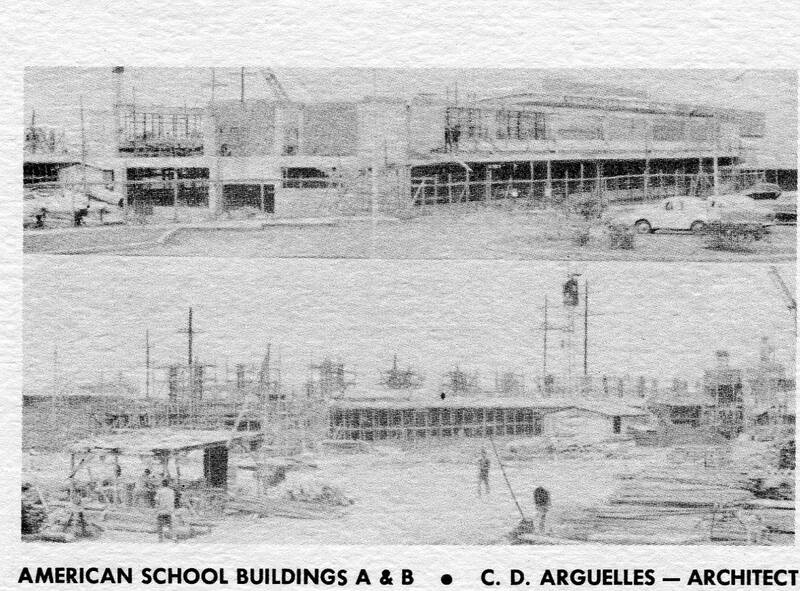 Back in the late 50s-early 60s, we had both Sangley navy kids and Jusmag kids going to the AS. Was it different in 1971 ? When we arrived in 1970 we were housed at Heroes Hill. We were bussed to Sangley Point. The school was a cluster of Quonset huts. I remember a debate about sending us to Faith Academy or AS. I was not aware of the arrangement you mention. Funny add on; i ditched school from Sangley with two female classmates and took the launch to Manila. We went to Seafront to hang out. My dad shows up for lunch and confronts me. As my two attractive friends approach he paused and said “Carry on son”! As usual, Lou, thanks for the memories. I actually made it into one of the pictures. Great article Mr.Lou,its reminds me about my favorite movies of all time “Back To The Future Part 1” about Marthy Mc.Fly and the Hill Valley High School. I look forward to every one of you articles Lou and they all are great! I have to say that this one brought back so many memories of my time at both the Donada and Bel Air campuses! Such wonderful memories of the places and friends that I will never forget and am so thankful for them all! Thank you Lou for bringing out both smiles and tears with your writings! Chip, Bob Greenwald here. I was a high school friend of yours. I returned to the states after 1964 school years. Kindly send me an email so we can catch up. Lou — Great job done clearly done with love. I kept looking at the pics of Donada Street hoping to catch a glimpse of our house, 1739, which was directly across the street from Heilbronn Hall. No luck. You may recall that Kawayan class photos for the elementary school were shot downstairs in our house for a few years. The capture text above gave me pause, as it reverses my father’s last two initials. Little things. Nostalgia indeed about the school across the fence from our back yard. In your photo of my grandfather in the garden, the “pals” he is with are his sons Adolfo and Donato and his son-in-law Lorenzo Onrubia, taken in the early 1930’s. I think I sent you another photo years ago with a swamp in the foreground and the Scheerer compound houses in the background. It’s that swamp that became AS. Hi Lou. My brother Bob viewed this, and he sees himself and Fred Elizalde in the photo taken at the Rizal Memorial pool. The guy in the white Barong is Rene Amabuyok, our coach for many years. Bob and Fred went on to distinguished swimming careers at Yale and Harvard respectively. Amazing look back! Thanks as always for your great work. This is the first time reading your articles and I must say I am hooked! My father was in the Navy and we were based in Queen and lived on a military compound I only remember being known as JUSMAG. We were stationed there from 1964 – 1969. I attended the American School from kindergarten through grade 4. I have very fond memories of those years! Paper Drives, going into the school auditorium to watch the APOLLO lift off, even the “covered playground”! My family was “sponsored” by the Tom Garrett family whom we became great friends with while there and continued to stay in touch once we were back in the US. His wife Barbara and children Tommy, Susan, and Casey visited us often once they were stationed at Camp Lejune, NC. I VIVIDLY remember the house we lived in while there. We would step out our back door and to the left within a short walk was the theater and to the right was the swimming pool and recreation center! The lifeguard was “Francisco”. The ferry rides crossing the bay to Sangley were a favorite treat to go shopping with my mother! My parents, Oscar Claude Marshall (known as Marsh to many) and Grace Marshall were Cuba Scouts leaders. My closest friend was Sharon Bunker and my brother Michael age 7 through 11 was friends with her brothers Jimmy and Kenny. We even experienced Molitoff Cocktails being thrown threw the windows of our home on several occassions! Our live-opinion housekeepers, Lena and Lucy were amazing. So much that we made efforts, to no avail to have Lena return to Norfolk VA with us when we departed. We had a monkey which was given to us by a veterinarian who I believe was Dr. Joseph. We came home on the USA PRESIDENT WILSON ocean liner that was an amazing 18 day trip from the Philippines to Hawaii, then Guam, and then we docked in San Fransisco, CA IN 1969, and flew home to South Carolina. I still have the 4 Kamins from our school years. I am so very glad to have found your site as I have done quite a bit of reminiscing the past couple of hours! Thanks for sparking these wonderful memories! I’m so very pleased you liked my articles, Terry. Thanks for writing ! Excuse autocorrect ..Quiz on City…not QUEENS. OH, also remember MOUSE BUBBLEGUM! also Dr Telford and his many housecalls made in the middle of the night for earache etc.! Thank you, Lou, of sharing such a wonderful article. It brought me back to more peaceful, less troubling times. Thank you, Lou, for sharing the article. I live in the neigborhood,and it feel great to know the story of the place. The story and the photos give me goosebumps. Thanks for the very fine article! I think the person dancing with Bobbie Fales, is possibly John Stuller. I was in the 3rd grade at the American School in 1948 as a dependent . We lived on a U.S. Army base in a family housing area, and traveled by military bus into Manila each day for school. So glad to find some information on my early childhood memories. My mother, Sibyl Ayers, died at 97.5 on Jan 20th, 2018. 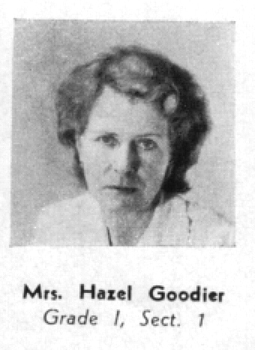 She taught second grade at the American School in 1948-49. She returned to the states pregnant with me. My father was a reporter for UPI. Thanks so much for this wonderful, informative article. We are taking her ashes back to all the places she loved. With this information we know where to go in Manila. I am sorry to hear of your mother passing. I’m sure she was a wonderful mother and teacher. Thank you for kind comment.